Technical analysis (TA) is the study of charts and the interpretation of those regarding a company’s share price. The technician looks at charts, plots trends etc and uses various technical indicators such as RSI, MACD etc in order to decide if a stock price is likely to go up, down or consolidate. The pure technical analyst doesn’t care about the fundamentals of a company, but relies solely on the charts. All charts are based on price, volume and a time period. From this input the technical analyst draws conclusions regarding future performance of the stock. Personally, charts for me represent the aggregate psychology of a certain stock or asset. The relatively short term trader in some ways speculates on the psychology of the market, and therefore studying charts becomes a vital part of the short term trader. Technical analysis is often based on the fact that historical patterns repeat themselves, so a certain chart set up is likely to be followed by a similar price action we saw last time the same setup occured. Charts and technical analysis should be studied by every person involved in trading markets. Even the fundamental trader should have a grasp about basic concepts in technical analysis. Concepts such as trends, resistance/support are applicable to all charts and give a good input regarding the prevailing psychology, relevant even to the fundamental investor as well. Charts are plotted as time series of each specified time on a price scale. Charts can range from tick (every tick of the stock price) to ranging to plotting daily, weekly, monthly or even yearly charts. The most common charts are line, bar and candlestick charts. Preference of which to use is subjective. There is no right or wrong and it usually takes time before the novice trader develops a preference for looking at charts in a certain way and using specific charts and indicators. Line chart is the most basic type of chart as it represents the closing price only. Bar chart shows the open, close, high and low for a trading session. Many traders also use the option to ”paint” the daily bar chart in black or red depending if the session closed higher or lower compared to the opening price. Candlestick charts were first used over 300 years ago in Japan. Use of candlestick charts has become very popular over the years. The candle chart measures the same open, close, high and low as a bar chart, but the area between the open and the close is a shaded area. Traders usually colour a lower close than the open area in red (seen as a negative day), while a higher close than the open is often coloured in black or green (positive day). Do note that a positive day can occur despite the fact a stock actually lost value that day. Candlestick charts are probably the most popular charts for traders and you can read more about those charts in our section Candlestick charts. S&P 500 index shown with a candlestick chart, the bar chart and the line chart. The red, yellow and green are moving averages. The trend is the direction of a stock price. If the stock is moving higher it is called an uptrend, if it is moving lower it is called a downtrend. A trend is plotted on the chart (mostly manually) by connecting several points on the chart. The more points to connect the better the trend accuracy. Mostly this is done by connecting the lows of the chart with a trend line, the reverse is valid for a down trend. Bear in mind you will never be able to connect all points of the chart pattern. It is more important to find the general trend. Plotting trends is an art itself and the seasoned trader easily spots the relevant trend. At times you can also connect the highs with a trend line as well as the lows, the so called trend channel. In a rising channel, the lower trend line gives the support level, while the upper trend line gives resistance levels. The trend is usually used to find support or resistance of the stock and determine when to enter, add or reduce a position. There can be various trends within a bigger trend. A stock can for example move higher over a 2 year period, but inside that trend we often find shorter term trends that can be of different steepness. Generally speaking it is painful to trade against a prevailing trend. This is called being a contrarian, and they seldomly survive for long. Some traders start plotting trends everywhere. Those charts tend to become rather confusing. Generally speaking you should identify the primary trend, and then work with shorter term trends inside the primary trend depending on your time frame of trading. Support/resistance is the second basic concept in TA. People often refer to certain levels where the stock bounces from. This is best seen on a chart as a support. We often also hear that stock X can’t go above a certain level and reverses of that level, this is the resistance. Support/resistance levels are important for all traders/investors and these levels usually represent big interest and you can study the psychology well. Many times when a support or resistance is broken, stocks tend to move sharply away from those levels and create almost a vacuum. This vacuum is often created since the Pavlovian investor has learnt a specific behaviour at a certain level, to buy the support level for example. Assuming the stock has bounced many times, this cognitive behaviour reinforces the belief the stock will bounce again. Traders have learnt to buy the support and get confused when the stock breaks below the support. This itself creates an interesting psychology since stop losses are triggered, possibly big sellers needs to sell more shares, hedgers need to off load more shares in order to hedge etc. This psychology often creates exaggerated moves creating good trading opportunities. Below chart shows the classical support and resistance chart that developed for circa two years (2013/14) in the Ebay stock. This was a great trading set up where the support held many times, as well as the stock reversed on the resistance levels many times. A channel is a pattern indicating continuation. The stock is ”trapped” in a channel, that slopes up or down, and is bound by an upper and lower trend line. The trend lines mark resistance or support. Positively sloping channels are bullish and negatively sloping channels are bearish. Below is a chart showing a long term trend channel in Apple developed back in 2009 and lasted for almost two years. Note how the stock bounces higher on supports as well as how the stock retraces off the highs of the channel. The double bottom or double top are some of the most well known patterns and are reversal formations. The double bottom is a formation where a sell off is followed by a bounce higher, people get excited as they see the low has been established, to shortly thereafter see the stock sell off once again, many times sharply. This second sell off is then once again met with buying and we see another bounce. The last part of the pattern usually results in the second bounce going through recent highs and we often see a powerful squeeze higher in the asset. The psychology of this classical pattern is that shorts get very confident, but as the first bounce occurs, shorts tend to get a bit confused/nervous. At the same time traders that want to enter long positions see the stock bounce and are often regretting they didn’t buy the first sell off. This starts creating the greed and fear factor. When the second sell off occurs, the second dimension of the psychology starts playing out. Shorts once again get confident this is a dog and that we will see a break down, only to get confused once again by the second bounce. Keen buyers will once again get frustrated why they didn’t buy the asset as it was lower again. The second bounce creates an even stronger greed and fear among investors. Shorts will start experiencing difficulties and frustration as the stock doesn’t want to come down again and they start chasing the stock higher. Real buyers will experience they either missed to buy at nice levels or they didn’t buy enough. These buyers will also start chasing the stock, resulting in usually a great squeeze higher. When the inverse happens on a top, we call it a double top. There are also triple top and bottom formations. The psychology is similar to the double formations, but in the process of bouncing and selling of, the triple formation has another leg lower and higher. The zig zag continues for longer before the break out occurs. Below is a chart showing the classical double bottom formation in the S&P 500 in early 2016. Note the almost perfect double bottom creating big psychological dynamics and the violent break out higher as the neckline is perforated. The head and shoulder (HS) pattern is big reversal pattern that develops at highs. The pattern is characterized by a new high that is followed by a pull back. After the first pull back we see a new high, often taking out the previous high. This second new high is also followed by a pullback. The last part of the pattern is another attempt to make another new high but this one fails to reach the second high and we get the third pull back. Buyers are simply getting out of steam. The underlying psychology of this pattern also creates frustration among investors. Buyers get confident but are at the same time increasingly scared as the stock doesn’t reach recent highs as the third top develops. Shorts on the other side tend to get rather nervous since the stock refuses to top out quickly. The interesting thing happens when the stock breaks down below the neckline. Usually the price action becomes violent to the downside when the neckline gets broken. We often see a vacuum effect take place, where prices fall rapidly. There are several ways to interpret and try to estimate the move lower, but as a general rule traders usually see the potential move lower approximately the same as the difference between the neckline and the second high. Just as with double tops, the HS pattern occurs on lows and is then called an inverse HS formation. The chart is showing the head and shoulder formation in Fingerprint. This is a somewhat kinked version as it is not totally symmetrical. Note the two shoulders, the head and the neckline. In this example the target price is reached perfectly since the stock falls exactly to the projected level. Fingerprint went from being a small cap stock to an extremely popular stock as it was suddenly repriced due to its technology of fingerprint sensors. The stock was at one stage the most traded name in Europe on a daily basis. It is common to see these type of parabolic moves end up with a head and shoulder formation, often leaving most retail investors in tears. The above are all reversal patterns. There are a few patterns technicians refer to as continuation patterns. Triangles are continuation patterns, where price action after a certain move goes into a somewhat of a consolidation mode, where the buyers and sellers change hands. When the distribution phase ends, we often see a violent break out with heavy volume take place, and the stock continues higher or lower depending what kind of triangle was formed. The stock basically gets trapped inside a trend (rising or falling) as well as a support/resistance keeps the stock from moving the other way during the phase of the triangle developing. Traders learn to buy the support and sell the resistance until the triangle gets totally closed and we get a break out. nacle all the way out. There is no truth to how a triangle exactly needs to be developed in order for the break out to occur. Charting and studying many triangles usually gives the trader an insight into how they work and what to expect. There are asymmetrical triangles, the rising and the falling triangles. The rising or ascending triangle has buyers stepping up and paying higher while sellers are stuck at one level which becomes a resistance level. The psychology plays out when the pattern gets further and further trapped in the triangle and is usually followed by a violent move with good volume. The rising triangle break up and is a continuation pattern, while the falling triangle break down and is followed by a down trend. See the chart below for a classical ascending triangle in Nasdaq. Note the powerful break out, followed y a typical little retracement and then the real take off higher. Wedges are similar patterns to triangles but are reversal patterns. The wedge is composed of diagonal support and resistance lines that get closer and closer to each other. As the price moves in a narrower range the end phase of the wedge creates complex dynamics resulting in a big reversal, often accompanied with big volume. The rising wedge results in a break down lower, while the falling wedge abruptly ends the down trend and we see a big reversal higher. The price action when a wedge breaks out is usually violent due to the complex psychology having developed during the formation of the wedge. Investors usually think the trend will continue, but we often see a total reversal of the trend. Below is a falling wedge formation in Apple back in early 2016. The stock had been under pressure for some time, the short term trend was negative. The falling wedge was eventually broken and we saw a rather big move higher. See below for a rising wedge in DAX index. The short term trend got exhausted and was finished with the rising wedge and a break down lower. Flags are patterns that form after a trend goes into a small consolidation. The flag is a continuation pattern of the trend that was in place prior to the flag forming. You can see the flag as a small pause where the stock needs to catch breath in order to get the momentum reignited. 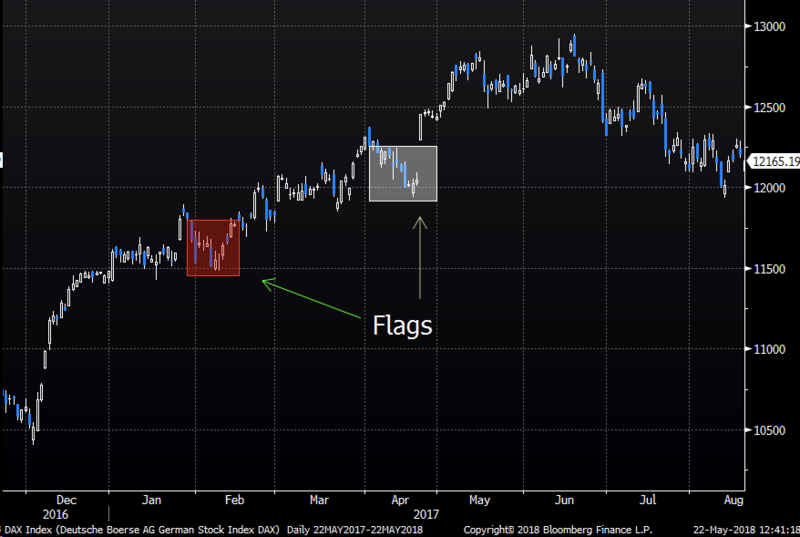 Flags are usually formed after a strong trend has been in place. The bullish flag is paradoxically the small sell off we see in a stock that has usually had a strong move higher. A small downtrend is formed and you will see it as a small channel down looking like a flag. The psychology of the pattern tells us the buyers have gotten a bit tired and there are some keen traders to sell this stock. During this distribution phase buyers tend to get new appetite for the stock, resulting in pushing the stock even higher as the stock breaks out of the flag. The bearish flag is the inverse to the bullsih flag, and is followed by the stock taking out new lows. Bull flags in a rising trend in DAX index. Below chart shows bear flags in the Russell ETF (IWM US). There are many different technical indicators. All indicators are derived from price and volume. Most brokers offer trading platforms that will give you possibility to study charts and probably a few pre programmed technical indicators to use. Prices are usually displayed in the upper part of the chart giving you the price information, ie the chart of the stock. You can then apply various indicators in sub charts below the main chart. Most traders will always have the price chart as well as a volume subchart and then add technical indicators. Indicators such as moving averages are displayed in the main price chart while indicators such as: RSI, MACD, oscillators etc usually get plotted in subcharts. As we have mentioned earlier, novice traders many times get very involved with studying many indicators and use too many indicators, resulting in trading with too many inputs. Trading should not be too simplified, but should also not be made too complicated. If 4 indicators give a clear signal, but you also take into account 3 other indicators that are more doubtful about your setup, you might end up not trading and potentially missing a great opportunity. Successful traders usually use a few favourite indicators, blend these with preferred charts like candlesticks, and with prudent risk management make trading an art! There are various technical patterns traders look for. Below are a few of the most common patterns. As we have mentioned earlier, technical analysis is the psychology of the asset plotted in a chart. Therefore, all patterns actually describe the aggregate psychology of investors/traders in the asset. Studying these patterns help you as a trader better understand what is going on in the market. The Relative Strength Index (RSI) is one of the ”first” technical indicators traders get familiar with. It is a momentum indicator that compares the magnitude of recent gains/losses over a certain time to speed and change of price movements of a security. Traders identify if a stock is overbought/oversold by looking at the RSI. Many use the default time 14 days to get the RSI. Generally speaking a RSI value of 70 or higher is seen as overbought territory, while a value of 30 and lower is seen as oversold. Note that RSI levels can remain high or low for long periods of time when the prevailing trend is strong (up/down trend). The RSI can be combined with other indicators in order to get more input to your trading set up. Many traders use the RSI in a way where they look for divergences between the RSI and the stock price. See below chart of Apple and the RSI. Note the two oversold areas when the RSI dips to the 30 ish area and the following violent moves higher, as well as the overbought RSI territory that eventually is followed by the stock reversing. Moving averages (MA) help smooth out erratic stock price movements as the day-to-day fluctuations are smoothed out (blue line in the chart above). The MA is the average price for a certain set time period. These values produce a MA chart that is plotted usually in the same chart as the actual price of the asset itself. When the stock trades higher the moving average will slope upwards, and vice versa when the stock trades down. Traders use various time frames depending on their preference and what they are looking for. Most traders refer to the 200 day average as the long term average that give a stock a big support level. 100 day average is another popular longer term average traders use. 50 and 21 day averages are often seen as intermediate trends and are used by shorter term traders as well by longer term investors wishing to add/reduce positions. Moving averages of 11, 8 and 5 day are often used by short term traders. Many traders also use a combination of two or more moving averages. The more short term the average the more sensitive it is to recent stock price moves. One of the more well known MA combinations is called the death cross. This occurs when the 50 day average crosses the 200 day average from above. This is considered a rather bearish signal longer term for a stock. 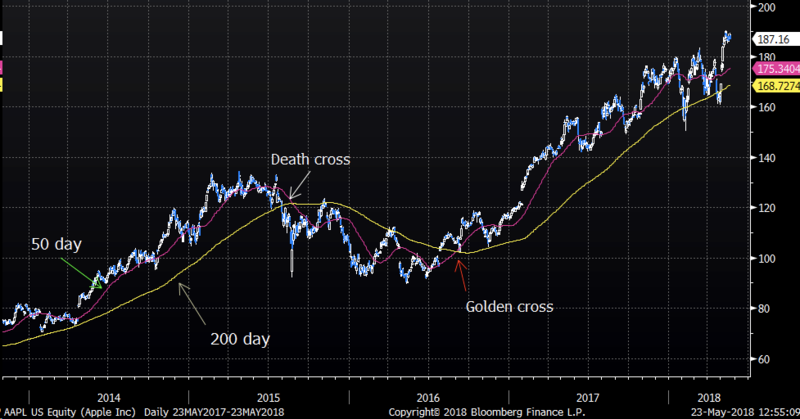 The inverse to the death cross occurs when the 50 day crosses from underneath the 200 day average and is called the golden cross. Chart showing Apple with 200 and 50 day moving average. Note how the stock bounces off the 200 day average in a big uptrend as well how it retraceces off the 200 day average when the trend is negative. Worth reviewing is the golden and death crosses in this chart as they are both followed by big trending moves. The Moving Average Convergence/Divergence oscillator (MACD) is probably the simplest and most effective momentum indicator. MACD turns two trend-following indicators, moving averages into a momentum oscillator as the longer moving average is deducted from the shorter moving average. The MACD indicator oscillates above and below the zero line as the moving averages converge, cross and diverge. Bollinger bands (BB), developed by John Bollinger, is an indicator that uses a moving average with two trading bands (standard deviations of the stock) above and below it. This momentum indicator compares present price in relation to where the price was in the past. The past is a subjective input by the trader. Since BB can be seen as a form of standard deviation tool, volatility affects the bands in such a way that during more volatile periods the bands will widen, and in less volatile time the bands will contract. A general rule of thumb is to stay away when the bands are in contraction. These periods are often trend less and choppy, often catching the trader wrong. Different traders use the BB methodology differently. As an example the upper part of the band can be used as a form of take profit on longs levels, but be aware that a stock in strong trend can be trading close to the upper band for a long time, the same but inverse is valid for a stock trading in a strong downtrend. Apple chart with Bollinger bands. Note the compression and expansion phases. On balance volume (OBV), developed in the 60’s by the technical guru Mr Granville, uses volume flow to predict future price movements. Simplified the OBV indicator tells that when volume increases greatly without a significant change in the stock’s price, the price eventually jumps upward, and vice versa.